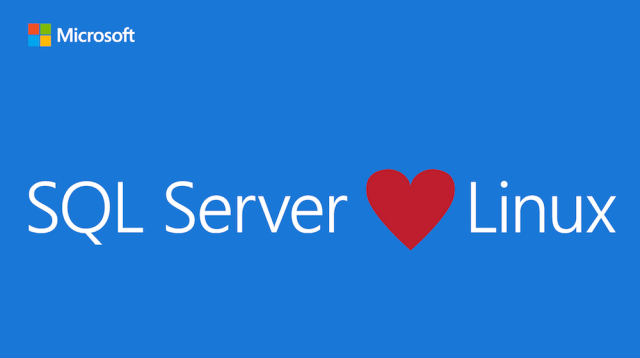 Microsoft SQL Server now runs on Linux. The latest release, SQL Server vNext CTP1, runs on Linux and is in many ways simply SQL Server. It’s the same SQL Server database engine, with many similar features and services regardless of your operating system. SQL Server vNext CTP1 is supported on Red Hat Enterprise Linux and Ubuntu. It is also available as a Docker image which can run on Docker Engine on Linux or Docker for Windows/Mac. In this article, we'll walk you through the steps to install Microsoft SQL Server on Red Hat Linux and Ubuntu 16.04. This guide also covers how to run the SQL Server Docker image on Linux, Mac, or Windows. In the end of article, we will be connecting to SQL Server with sqlcmd, creating and populating a database. In this section of the article, we will walk you through the steps to install SQL Server vNext CTP1 on Red Hat Enterprise Linux (RHEL) 7.2. After the package installation finishes, run the configuration script and follow the prompts. You may need to open a port on the firewall on RHEL. If you are using FirewallD for your firewall, you can use the following commands. In this section of the article, we will show you how to install SQL Server vNext CTP1 on Ubuntu 16.04. In this section of the article, we will explain how to pull and run the mssql-server Docker image. This image can be used with the Docker Engine 1.8 on Linux or on Docker for Mac/Windows. Docker Engine 1.8+ on any supported Linux distribution or Docker for Mac/Windows. The default on Docker for Mac and Docker for Windows is 2 GB for the Moby VM, so you will need to change it to 4 GB. The following sections explain how. Click on the Docker logo on the top status bar. Click the restart button at the button of the screen. Pull the Docker image from Docker Hub. To persist the data generated from your Docker container, you must map volume to the host machine. To do that, use the run command with the -v :/var/opt/mssql flag. This will allow the data to be restored between container executions. The ACCEPT_EULA and SA_PASSWORD environment variables are required to run the image. Volume mapping for Docker-machine on Mac with the SQL Server on Linux image is not supported at this time. 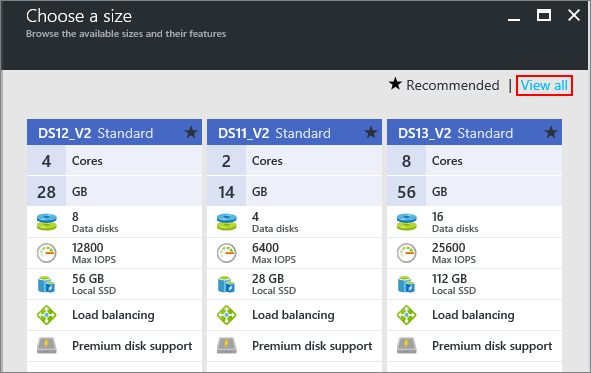 Azure provides Linux virtual machine images that have SQL Server vNext CTP1 installed. This section of the article provides a short walk through on how to use the Azure portal to create a Linux SQL Server virtual machine. Click New on the left. In the New blade, click Compute. Click See All next to the Featured Apps heading. In the search box, type SQL Server vNext, and press Enter to start the search. This filter shows the available Linux virtual machine image(s) for SQL Server vNext. Over time, SQL Server vNext images for other supported Linux distributions will be listed. You can also click this link to go directly to the search results for SQL Server vNext. Select a SQL Server vNext image from the search results. On the Basics blade, fill in the details for your Linux VM. You have the choice of using an SSH public key or a Password for authentication. SSH is more secure. On the Size blade, choose a machine size. For development and functional testing, we recommend a VM size of DS2 or higher. For performance testing, use DS13 or higher. For instructions on how to generate an SSH key, see Create SSH keys on Linux and Mac for Linux VMs in Azure. To see other sizes, select View all. On the Settings blade, you can make changes to the settings or keep the default settings. On the Summary page, click OK to create the VM. 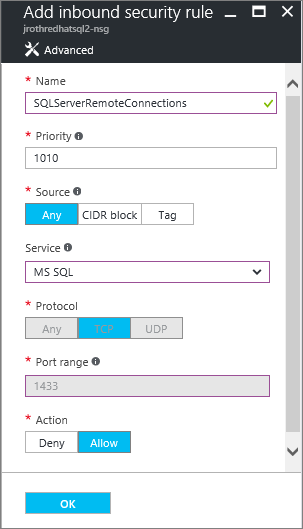 The Azure VM pre-configures the firewall to open the SQL Server port 1433 for remote connections. But to remotely connect, you also need to add a network security group rule as described in the next section. 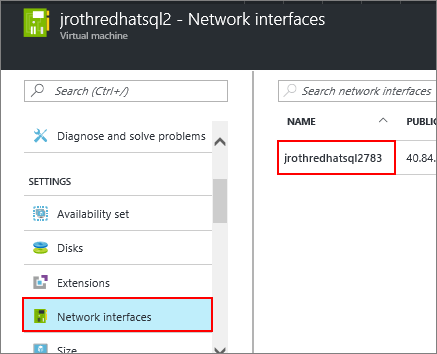 To be able to remotely connect to SQL Server on an Azure VM, you must configure an inbound rule on the network security group. The rule allows traffic on the port on which SQL Server listens (default of 1433). The following steps show how to use the Azure portal for this step. In the portal, select Virtual machines, and then select your SQL Server VM. In the list of properties, select Network interfaces. Then select the Network Interface for your VM. Click the Network security group link. In the properties of the Network Security Group, selct Inbound security rules. Provide a Name of "SQLServerRemoteConnections". In the Service list, select MS SQL. Click OK to save the rule for your VM. If you already use a BASH shell, connect to the Azure VM using the ssh command. In the following command, replace the VM user name and IP address to connect to your Linux VM. You can find the IP address of your VM in the Azure portal. If you are running on Windows and do not have a BASH shell, you can install an SSH client, such as PuTTY. On the PuTTY configuration screen enter your VM's public IP address. Click Open and enter your username and password at the prompts. After connecting to your Linux VM, open a new command terminal. Set up SQL Server with the following command. Accept the License and enter a password for the system administrator account. You can start the server when prompted. In this section of the artice, we will show you the steps to install the command-line tools, Microsoft ODBC drivers, and their dependencies. Download the Microsoft Red Hat repository configuration file. Run the following commands to install mssql-tools. Sqlcmd and bcp are not available on macOS. This section of the article provides connection requirements and guidance for SQL Server vNext CTP1 running on Linux. In most cases, the connection requirements and processes do not differ across platforms. This section approaches the subject in the context of Linux and then points to other resources. In the following steps, you will use sqlcmd to connect to SQL Server vNext on Linux. After successfully connecting, you will use Transact-SQL (T-SQL) queries to create and populate a small database. To connect to SQL Server on Linux, you must use SQL Authentication (username and password). To connect remotely, you must ensure that the port SQL Server listens on is open. By default, SQL Server listens on TCP port 1433. Depending on your Linux distribution and configuration, you might have to open this port in the firewall. In the following steps, connect to SQL Server vNext on Linux with sqlcmd. Query SQL Server for a list of the databases. Use Transact SQL to create a database. Create and populate a table in the new database. To to complete each of these tasks, copy the Transact-SQL from the examples below into the sqlcmd session that you created in the previous step. To end your sqlcmd session, type QUIT. In this article, you installed SQL Server on Red Hat Linux, Ubuntu, macOS including provisioning of Azure VM. And in the end you have connected to SQL Server with sqlcmd, and created and populated a database. Excellent writeup. Thank you for helping out!